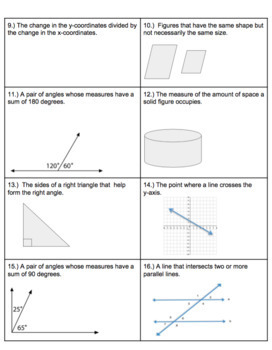 This review worksheet covers most of the important words used in 8th grade math. 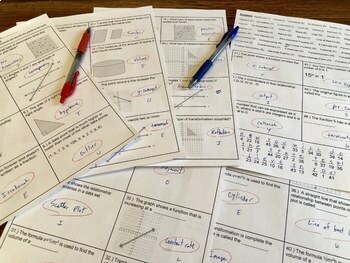 It is a great review for students before the state test. Students must read the definition or picture and match the vocabulary word that goes with it, they then must solve the puzzle on the back. 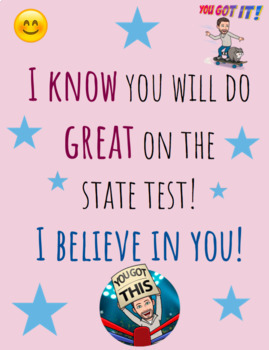 The puzzle is some words of encouragement for the students on the state test. 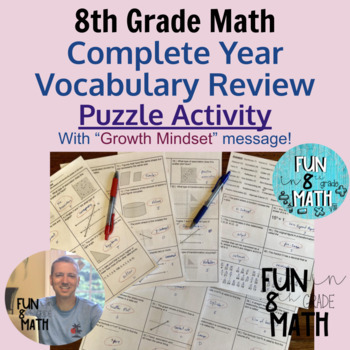 The vocabulary words included are; hypotenuse, volume, transversal, no solutions, dilation, alternate interior, adjacent, correlation, coincident, cone, output, rational, constant rate, input, no association, outlier, slope, legs, similar, repeating decimal, rotation, reflection, radius, sphere, line of best fit, solution, cylinder, one solution, zero exponent property, x-Intercept, pre-image, terminating decimal, corresponding, non-linear function, irrational, scatter plot, congruent, supplementary, y-intercept, complementary, translation, positive association, alternate exterior, slope-intercept form, function and image.